Like every other area in the country, Emyvale suffered mass emigration as a result of the Great famine (1845 - 1848). However a lesser emigration took place between 1830 and 1841 and this was to form a unique link between Emyvale and Prince Edward Island, Canada. The man responsible for this exodus was Very Rev. Canon Patrick Moynagh, PP Donagh. He encouraged and indeed, in some cases, paid for his parishioners to emigrate to this fertile island. Professor Brendan O’Grady, of Charlottetown University, who has carried out so much research in this aspect of Irish emigration to PEI has written: Of the several thousand immigrants from two dozen Irish counties, who came to PEI in the first half of the 19th century, the largest group originated in Co. Monaghan. Between 1830 and 1850, they came out from the baronies of Truagh and Monaghan, deserting their cottages in Donagh, Tydavnet, Clontibret, Emyvale, Glaslough, Tyholland and Monaghan town, for the promise of a better life in Canada’s smallest Province. Here they carved communities out of the wilderness, cultivated the clearings, applied their skills in many trades, and made their mark on the political and ecclesiastical history of a place, once officially called ‘New Ireland’. St. Patrick's Church, Corracrin, in memory of Canon Moynagh. Canon Moynagh was a self-educated man and spent some years in Tydavnet before coming to Donagh in 1815. As PP of Donagh, he resided in a little house in Mullaghbrack. He remained as PP until his death in 1860, during which time he also served as Prior of Lough Derg for 30. years. He built St. Mary’s Church, Glennan, in 1837 and was always very generous to the poor. 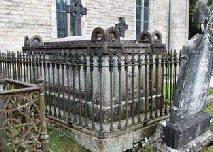 He was so revered by the people of the parish that a large vault was erected at St. Patrick’s Church, Corracrin, to hold his remains. The inscription on the tomb reads: ‘Underneath are deposited the remains of the Very Revd. Patrick Moynagh, Parish Priest of this parish, and for many years Prior of Lough Derg. During his long and laborious life, he was a constant benefactor of the poor, and at his death bequeathed the interest of all the property he was possessed of, for the annual relief of the poor of this parish, which had been so long blessed by his edifying life. He departed this life on the 2nd August, 1860, aged 82 years’. The first realisation of the close connection between Donagh and PEI came in the late 1950's when Professor Brendan O'Grady began his research and discovered that his wife was descended from a Delany family who resided in Emyvale, Ireland. The Delanys were stone carvers who had taken over from the MacKays, who were employed by the Leslie family and originally came from Scotland. Correspondence ensued between Brendan and mainly three people here - Seamus McCluskey, Bennie Hackett and Fr. Barney McCarney, and Brendan also paid a visit to Emyvale. However the connection remained on an academic level until the late '80's when the PEI authorities started to organise Irish festivals and encouraged the links with Emyvale Ireland. A fresh connection was made to coincide with the island festival - ‘We’re Akin To Ireland Year’ in 1990 and after many visits by officials both ways, County Monaghan and PEI were twinned at a special ceremony on St. Patrick’s Day, 1994 in Monaghan. Local Councillor, Willie McKenna, and Seamus McCluskey, played a major role in the re-establishment of the new ties. Since then a big number of inhabitants from the island have visited Emyvale, and many of them have discovered the ancestral home and have been introduced to relatives.